I have a philosophy that whatever I do on New Year's Day represents what I'll be doing throughout the year. My plan for today: Spend several hours working on the novel and go for a run. Then, spend an hour or so working on our bathroom where a renovation begun in 2001 came to a grinding halt and hasn't been resumed since. So here it is, the day. How many other things I would like to do today. Let's see ... go to the pet store and pick out some dog toys. Walk around the big store next to Barnes and Nobles ... what the hey, I could go to B&N with my laptop. I'm sure I'd get some work done there. Sure I would. Greg and I went hiking at Goose Creek State Park yesterday. We saw a bald eagle fly overhead, along with an array of woodpeckers and sapsuckers. Pileated, red-headed, red-bellied and yellow-bellied. Chickadees, thrashers. On the way out of the park, we heard three isolated calls from a distance, a subdued, self-assured warble. 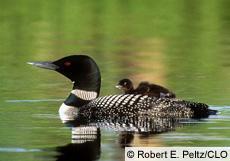 It was a loon, and I'd never heard one in person before. Our hike caps a pleasant weekend that began Saturday with a trip to Durham to see our friend Gene Downs, often a guest blogger on Fiction Daily. We spent the day traipsing to bookstores and drinking coffee, solving the world's problems one pastry at a time. Tabouleh and hummus sandwiches at Baba Ganooj. Greg tolerated our long discussions of plot and character, rambling about Victor Hugo and Charles Dickens, and helped me with my new camera.